This Syrian dish is super easy to make and only takes about 40 minutes from beginning to end. It's called Imjadara. I tried to look it up to get more information about it, but I couldn't find much online. 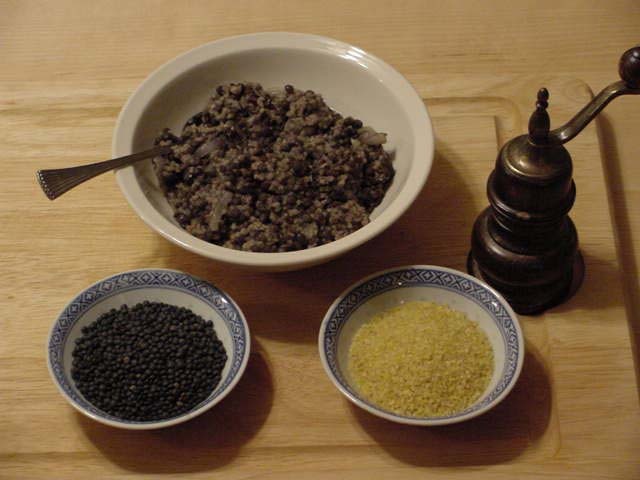 I did find many recipes for Moujadara, which calls for lentils and rice, unless you're Emeril. He apparently made this lentils and bulgur dish on his show but called it Moujdara. As far as I can tell, that's made with rice; Imjadara is made with bulgur. This is one of those dishes that's simple but delicious. I'll warn you right now--if you don't like Cream of Wheat you probably won't like this. I made it yesterday and I've eaten it twice, and both times I couldn't for the life of me think of what it tasted like, and then I realized that was it. I bought some Cream of Wheat a couple of years ago to eat for breakfast and I really liked it. I stopped eating it when I started eating oatmeal, but I missed it. So I'm really happy to have discovered this recipe. I used my favorite Trader Joe's black lentils, but any kind will work, according to the recipe. I cooked the onion more than the ten minutes the recipe called for so it would be well caramelized and it really added to the overall flavor. This recipe came from Lean Bean Cuisine, the book I went through at my brother's house. So far I've liked every recipe I've made. I think I may have to break down and buy the damned thing.